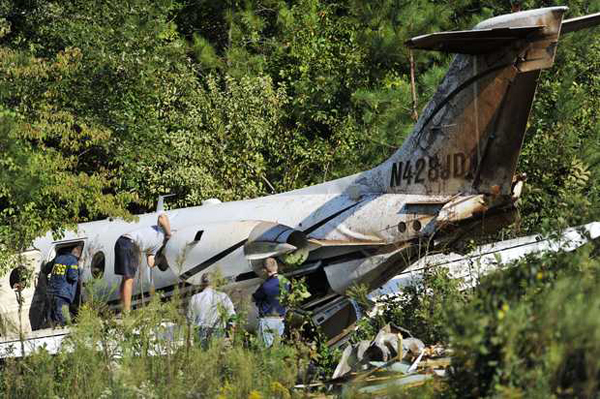 On September 18, 2012, about 1003 eastern daylight time, a Beech 400, N428JD, was substantially damaged when it overran runway 28 during landing at Macon Downtown Airport (MAC), Macon, Georgia. The airplane had departed from Charleston Air Force Base/International Airport (CHS), Charleston, South Carolina about 0930. Visual meteorological conditions prevailed and an instrument flight rules (IFR) flight plan had been filed. 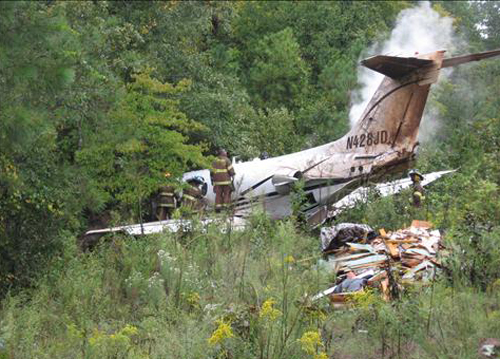 Both Airline Transport Pilots and one passenger sustained minor injuries. The corporate flight was conducted under the provisions of 14 Code of Federal Regulations Part 91. According to an interview with the pilots, during the approach the calculated speed was 108 knots. 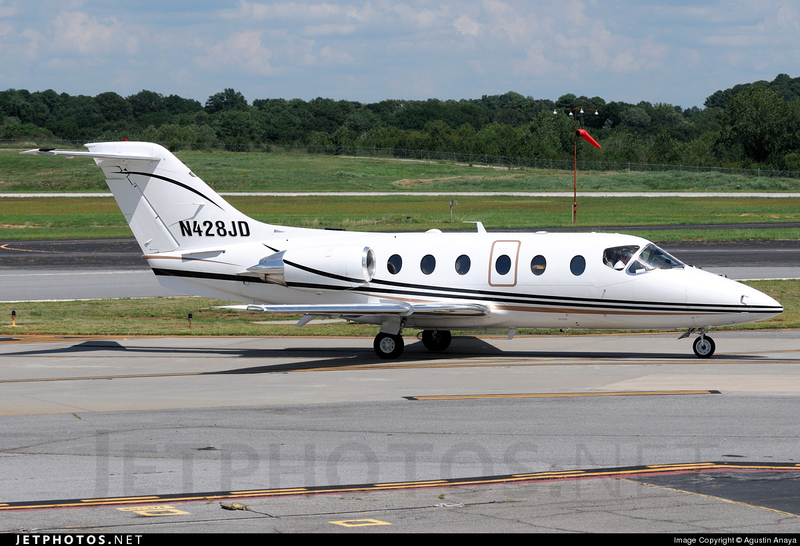 They reported the airport in sight to Macon Air Traffic Control (ATC) Approach Radar Control and canceled the IFR flight plan. The landing was within the first 1,000 feet of the runway and there was water visible on the runway. Maximum reverse thrust, braking, and ground spoilers were deployed; however, both pilots reported a "pulsation" in the brake system. 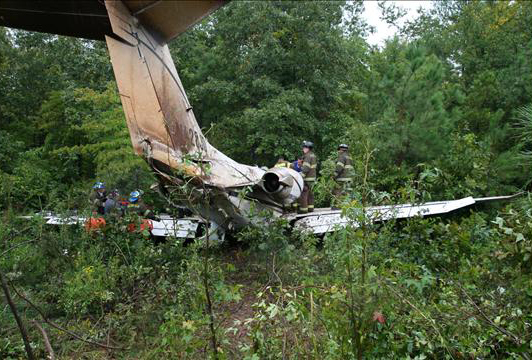 The airplane departed the end of the runway, traveled into the grass, went down an embankment, across the road, and into the trees. They further added that the airplane "hit hard" at the bottom of the embankment. Examination of the paved portion of the landing runway revealed that beginning approximately 1,000 feet from the departure end of the runway, evidence of tire tracks were visible. The tire tracks were observed veering to the left of the centerline and then veering to the right of centerline. Subsequently, the tracks exited the end of the runway into the grass, traveled to the crest of, and subsequently down an approximate 25-foot embankment, traveled across a two-lane paved highway, through some brush prior to coming to a rest. 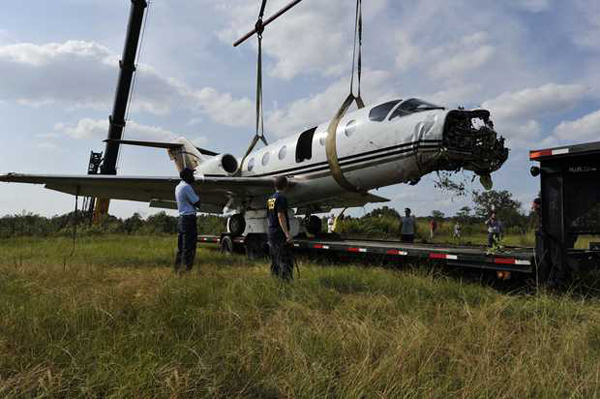 The airplane came to rest upright and at the base of a tree 283 feet from the paved portion of the runway and on a heading of 292 degrees. 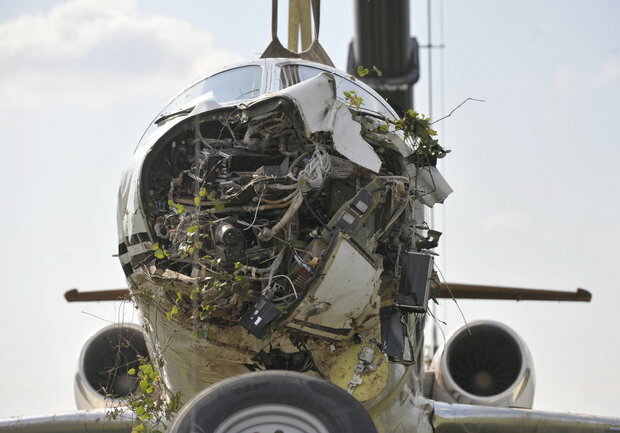 The cockpit voice recorder, Garmin 500 global positioning unit, Power Brake Valve, Antiskid unit, both wheel speed transducers, brake units, and hydraulic valve package, were retained by the NTSB for further examination.